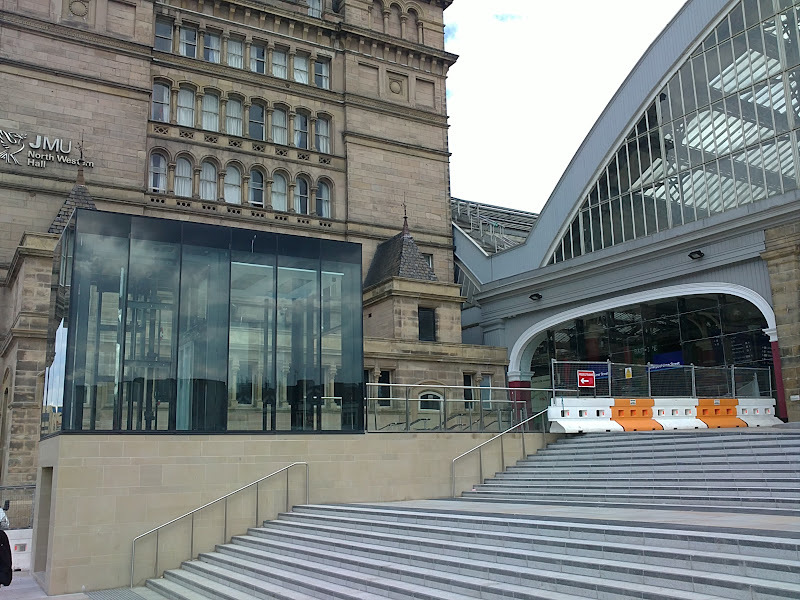 While I was in Liverpool pressing up against the artworks I took the opportunity to check out the nearly completed works at Lime Street Station. 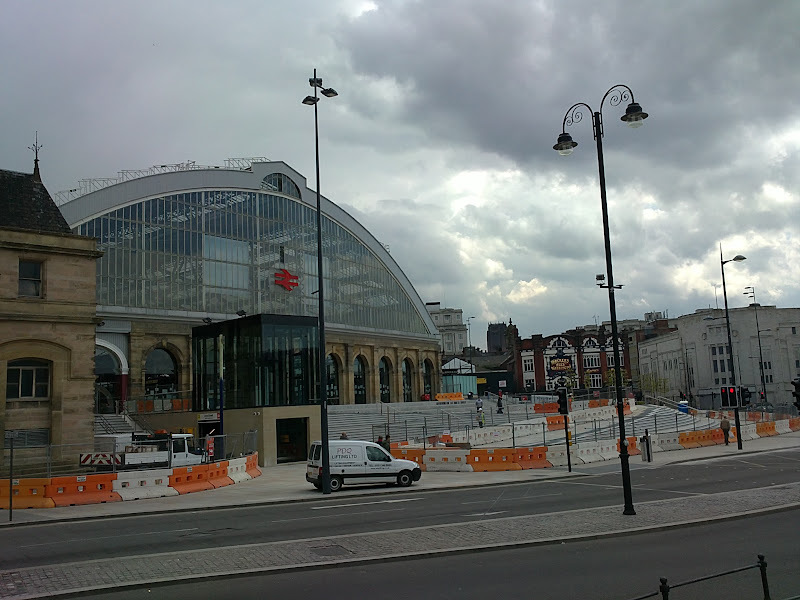 For a couple of years now, Lime Street has been undergoing a massive redevelopment, which has seen the entire frontage to the station torn apart and rebuilt. It's had a rocky road getting here. The station consists of two giant, arc roofs: the left hand one was covered by the beautiful Great Northern Hotel, now a student hall of residence. The right hand one has always been visible from the street, but contrary to public belief, it hasn't always been accessible: there were shops in front of it for decades. Only the large central archway in the frontage, used for vehicle access, was left open. The messy, but charming, mass of shops were swept away in a 1960s scheme which saw the construction of a long arc of shops and a sixteen-storey office block, Concourse House. It would perhaps be most polite to say the 60s scheme didn't age well. Faced in white tiles that either fell off or became discoloured, the shops were filled with a motley crew of tenants - a bookies, a leather goods shop, a hairdresser, a second hand bookstore. The cafe underneath the office block was a perfectly preserved example of a "caff" - all plastic seats and chipped tables and Luncheon Voucher stickers in the window. 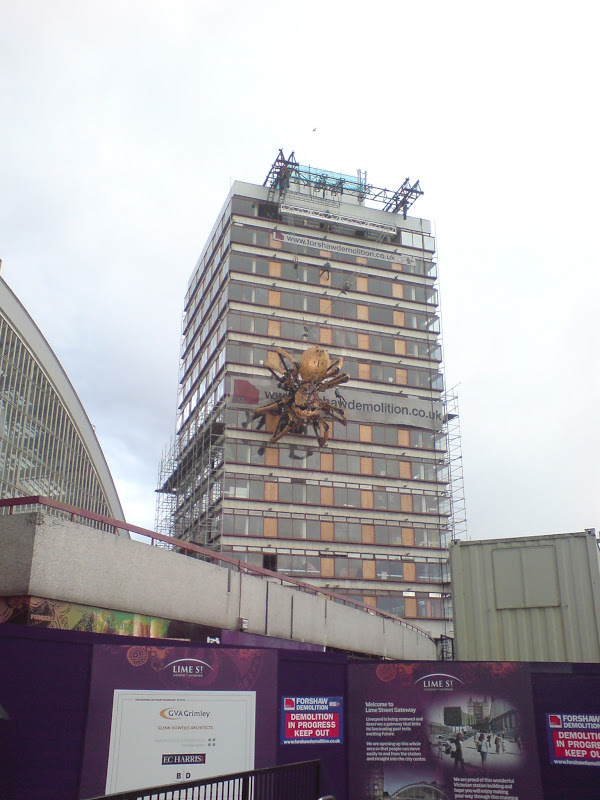 And Concourse House - seen here in its dying days, when a giant spider took up home on it - was by all accounts a miserable, dreary place to work, that had problems attracting tenants and turned out to be full of asbestos. Something had to be done. A scheme was conceived. The shops would be ripped away, and the fine 1830 frontage of the station would be exposed for the first time in decades above a piazza. 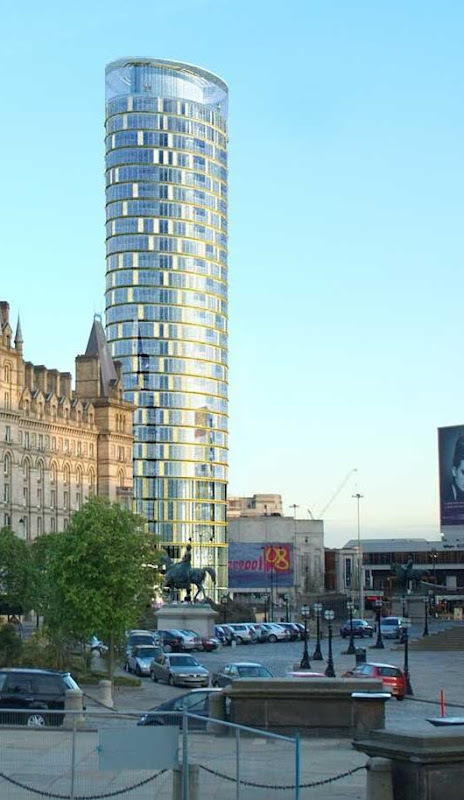 Replacing the tired Concourse House would be a 27-storey tower, with offices, apartments and retail units inside, with an observation deck at the very top for views across the city. It would restore this central point of the city's architecture to its former grandeur. 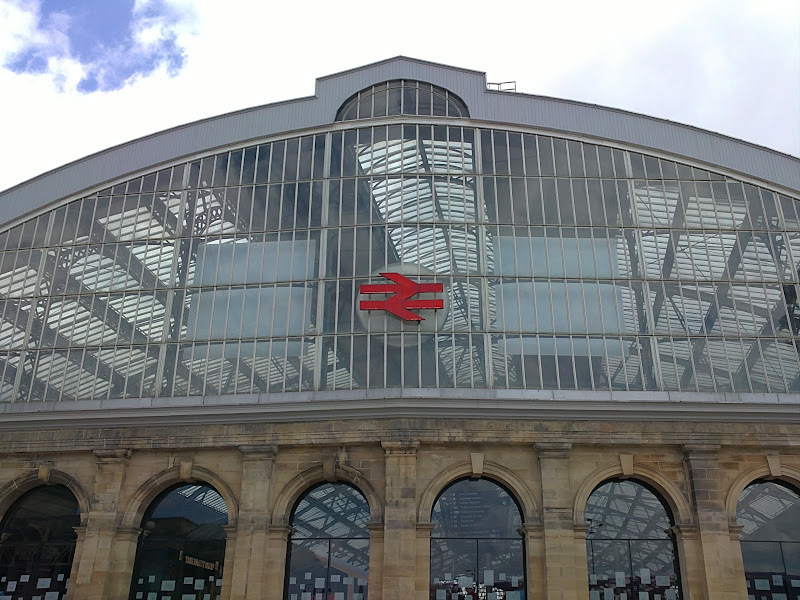 Thousands of people arrive in the city via Lime Street every year, and it would finally match up to Liverpool itself. You can smell the "but" coming, can't you? It seemed the shopkeepers weren't that keen to go. After all, the building might be a mess, but that wasn't their problem, it was the landlord's: and that's a heck of a lot of passing trade to give up. The consequence was that the scheme was dragged into the courts, with compensation levels being disputed and tenancies being debated. Some shopkeepers moved out, some didn't, making the whole row look even worse. By the time the shops were all empty, and work could begin, the scheme found itself credit crunched: suddenly there was no market for the tower, and it was shelved. Instead, we got steps. Lots of steps. 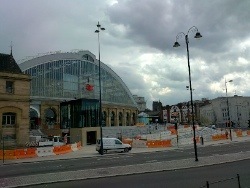 It's taken well over a year, but finally it seems that the Lime Street Gateway project is reaching its conclusion. There's still work to be done, but at least it's possible to walk around the station front again. 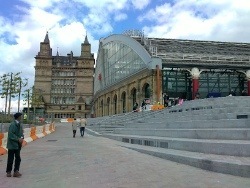 The station is now surrounded by a series of long, grey stone steps, with ramps built in. The steps are necessary to accomodate the severe fall of the land here: as you can see, there's a massive height difference from one end of the station to the other. Incorporated into some of the steps are landscaping, including the freaky tree things on the left which are clearly designed to force out SQUARE trees, which is clearly AGAINST NATURE. 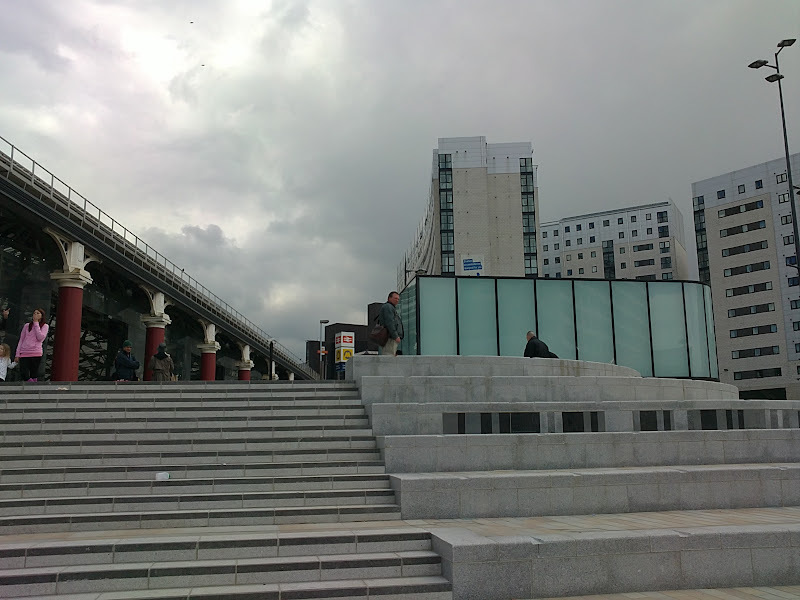 As well as the usual access stairs, there are larger, deeper steps, designed to double as seating. It was a slightly dull Wednesday afternoon, but there were already punters using them to rest on - I should imagine by summer they will be packed with people watchers, and during the various street festivals in the city, it'll be a prime spot. This is where the tower would have been, by the way: that blue-glass construction is an electricity sub-station which couldn't be moved, so had to be hidden in plain sight. If the tower had been built, there would have been escalators here in its foundations to carry you up into the station. Where there are steps, you instantly raise the question of disabled access, and the architects have chosen to incorporate a lift into the design to take you up to the station level. This is the most unsuccessful part of the scheme to me. Lime Street Station has three entrances: this one at the front, on Lime Street itself, and one on either side, in Skelhorne Street and Lord Nelson Street: is it really such an inconvenience to use these entrances? 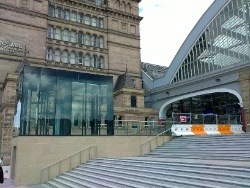 Not only that, the level sections between the steps have a "ramp" effect, meaning that the less able or people with bags could still get up to the front entrance. The lift just doesn't work, and blocks what would otherwise be a magnificent view out over St George's Plateau. What's undeniably improved is the front of the station, now the shops have gone. The glass archways bring even more light into the station, and allow you to fully appreciate the mighty Victorian engineering at work. I bet it looks even better at night, when the lights inside make the whole station shimmer. It's a nice, practical improvement scheme, which has brought a much needed air of class to a blighted area of the city centre. 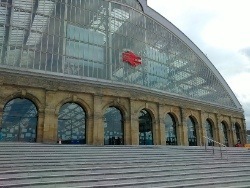 It'll give a much better impression to the city's visitors, as they step out of the front of the station and are confronted with the massive video wall and St George's Hall. There's also some artwork being incorporated into the final scheme: when it's all completed I'll go back and have a good look at that, too. It's strange to think that for all the various "improvement" plans that have gone on here over the years, the scheme which works best is when you strip back all the facades and just expose it for what it is. There's a beauty in railway station architecture, a power and elegance: the hard stone of the arches topped with the delicate ironworks above, peppered with glass and light. Lime Street station was pretty good to start with, and it's great that we can finally appreciate her again.